Over the past 15 years I’ve been working with recruiters around the world in large and small companies handling all types of positions. As I benchmarked their ability to find and hire the best active and passive candidates, I found 12 factors that stood out as the most important in predicting performance. Over the years this list has been revised, reviewed and recalibrated by dozens of talent leaders and different recruiters handling all types of assignments. 1. Driven to excel on every assignment. To be in the 5% on this factor you need to be committed to find and hire the best people on every assignment regardless of the difficulty. Desire is not enough. 2. Industry and subject matter expert. The best recruiters teach and write about talent supply/demand issues, understand and use industry and competitive trends, and know where the best people hang out and what it takes to find and recruit them. 3. Has close partnership with hiring manager. You can’t hire the best active or passive people unless the recruiter and hiring manager are on the same page. 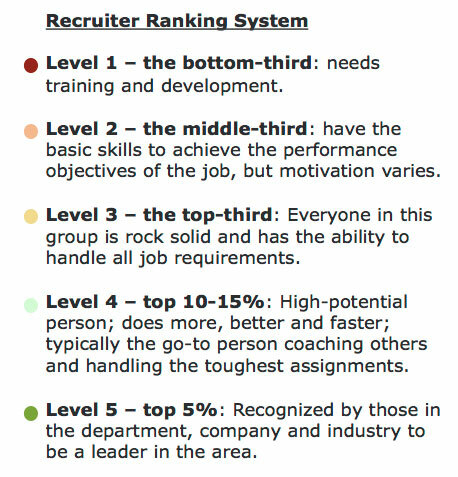 A top 5% performer only presents 3-4 candidates per search, leads panel interviews, and advises the hiring manager on defining the job and who should be hired. 4. Understands real job needs. The best people want to know the real job before they’ll engage in even preliminary conversations. Recruiters need to provide the correct answers to both attract and assess the person. The real job is a prioritized list of performance-based objectives not a bunch of skills, experiences, academic requirements and competencies. 5. Develops customized sourcing plans to target the strongest candidates. The best people don’t respond to traditional sourcing techniques. Top recruiters don’t wait for the best people to apply, they proactively seek them out based on a preplanned sourcing channel analysis. 6. 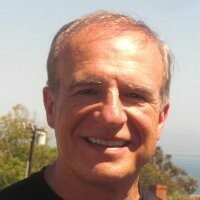 Active candidate sourcing guru. Uses everything and whatever it takes from mobile and social media to push compelling ads to the exact audience. Is on the cutting-edge of the leading approaches and optimizes everything to make it work flawlessly. 7. Cyber sleuthing and pipeline development expert. Can find needles in haystacks, get the best of the needles engaged and keep them warm until a great opportunity develops. 8. Passive candidate networking and recruiting star. First asks, “Who knows my candidate?,” then works this network to get warm, pre-qualified referrals. Can engage with the best talent, have credible career discussions, and convince the best to become serious prospects. Knows and teaches applicant control techniques. 9. Organizes everything and doesn’t waste a moment. In a world of too much work and too little time, recruiters with heavy req loads are time management experts. This is less important when a recruiter is working fewer assignments. From Boolean, LinkedIn, social media, using the ATS and dealing with interactive CRM, recruiters must be superb technical users of every tool available. Ignoring technology is not an option for a full-cycle recruiter handling a variety of different positions. Embracing it is. The best recruiters are as good as, if not better than, their hiring managers at assessing competency, fit and motivation. This is especially critical if the hiring managers are conducting narrow, flawed or superficial interviews. Here’s the full discussion on how to do it right. 12. Recruits and closes the best talent on careers, not compensation. You’ll never have enough money in your budget to pay the top people what they’re worth. The best recruiters know how to position the job as a career move with upside potential, and they overcome objections, challenges and counter-offers as they work towards the final close. The result of being great at these 12 factors is that you won’t be limited by bad policies, silly procedures, average managers, and inadequate compensation to find, recruit, assess and hire the best people available, not just the best people who apply. Doing it one time is hard enough. Doing it most of the time is worthy of rock star recruiter status. Becoming a rock star recruiter is worth it to you, your company and to every person who wouldn’t have a better job if it weren’t for you.